674 pages | 3 B/W Illus. 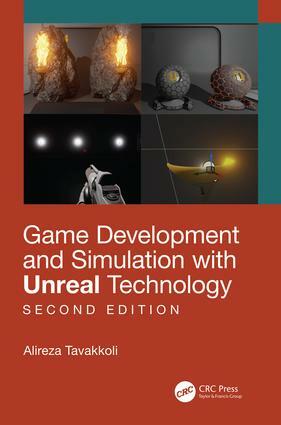 Dr. Alireza Tavakkoli’s Game Development and Simulation with Unreal Technology covers the latest version of Unreal Technology. Since the 1990s Epic Games, Inc. has been leading the revolution of gaming graphics and Artificial Intelligence. Now, unreal technology is one of the most potent and prominent engines that is currently used in games. Its influence can be spotted in classic triple A titles like, Fortnite, Gears of War 2, Borderlands 2, and XCOM: Enemy Unknown. Tavakkoli goes into detail concerning the creation of game level designs, blueprint coding, shader programing, as well as artificial intelligence concepts to help readers in creating their own games. Game Development also includes a number of practice friendly extensions and concept modules to help solidify the reader’s understanding of concepts and techniques. The book is divided into three sections that act as building blocks in order to facilitate the comprehension of the material. Chapter exercises will take the readers’ understanding of Unreal Engine to the next level. Dr. Alireza Tavakkoli is an Associate Professor of Computer Science at the University of Nevada, Reno. He teaches undergraduate and graduate courses in Computer Science, Computer Engineering, and Digital Gaming and Simulation. His research interests include Artificial Intelligence, Visual Computing, Robotics and Teleoperation, and Digital Gaming and Simulation. Prior to joining the University of Nevada, Reno, he served as a tenured professor of computer science at the University of Houston-Victoria and was the founding director of the Computation and Advanced Visualization Engineering Laboratory, where undergraduate and graduate students utilize a state-of-the-art motion capture studio for research in entertainment and serious gaming application.